Thanks greatly in part to Jeff, we’ve got EVOScan configured to monitor your Inspection Monitors! This is handy for the OBD2 guys who want to verify their cars will pass inspection before taking your car in and wasting the $$ to find out one hasn’t been updated. Note: If you disabled any bits in periphery 2-4, your car will likely NOT pass as these monitors will show as incomplete all the time. Each state has it’s own law about how many monitors it’ll allow as incomplete before failing your car so be aware of this. Now V2 has the ability force these monitors to stay completed. While this is 100% illegal for an OBD2 car to patch their ROMs with this code, the penalties for getting caught editing the Federal Standard code are quite high. Be warned that by editing these values you are essentially making your car illegal to drive on the street. Even if you still get your emissions sticker. Follow the instructions in all the tabs. 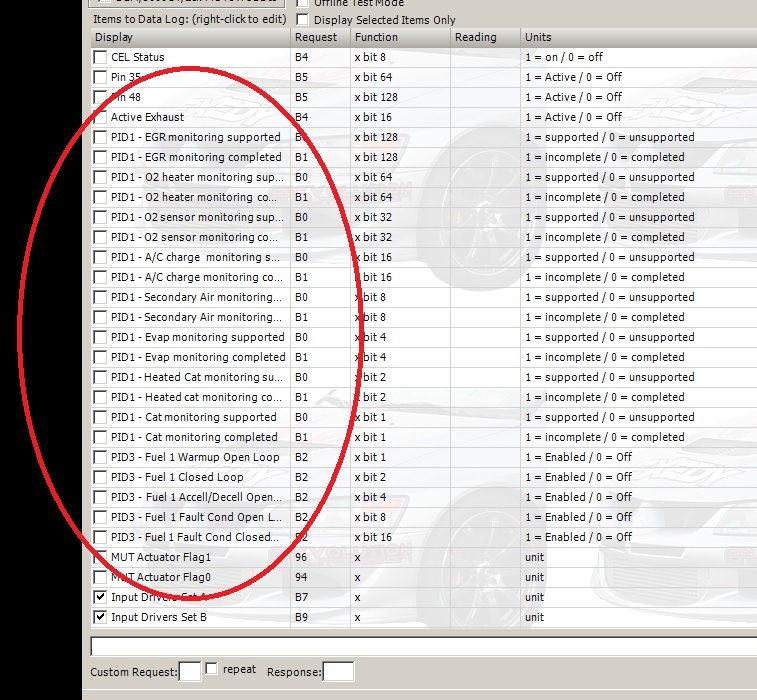 If you did it correctly the Quick Check tables will show the correct monitor status for our cars. This mod is for OFF ROAD use only!! !